Short ribs are one of the most confounding, yet rewarding, cuts of beef. They're unnaturally tough in their original condition, but when lovingly slow-cooked they develop a rich flavor and a lush, soft texture. Not surprisingly, your slow cooker provides one of the best ways to braise these meaty little morsels into rich, satisfying comfort food. Wipe the cut ends of the rib bones with a clean paper towel to remove any bone fragments. Short ribs usually have a sheet of tough membrane running along the back of the rib bones. If it's there, insert the tip of a knife under the membrane and loosen it, so you can get a grip, and then pull it off. Cut the short ribs into portions of one or two bones each, if they were not already portioned when you bought them. Sear the ribs in a hot skillet until they're well browned on all sides. This step is optional, but adds rich flavor to the finished dish. Transfer the ribs to your slow cooker. Add onions, garlic, carrots, celery or other aromatic vegetables, which infuse the ribs with their flavors during the cooking process. Season the ribs with salt and pepper, or with themed spice mixtures -- Chinese five-spice, for example, or chili powder -- if you're looking for an ethnic flavor. Add enough liquid to mostly cover the ribs. The liquid can be plain water, if necessary, but it's better to use something flavorful. Beef broth, wine, beer, tomatoes in juice, diluted soy sauce, or barbecue sauce thinned with water or broth are all appropriate options. Cover the slow cooker with its lid, and simmer the ribs until they're tender enough to break up easily with a fork. That will typically take up to 4 hours on the High setting, or 8 to 10 hours on Low. Remove the ribs from the cooking liquid with a slotted spoon, and set them aside in a bowl or serving dish. If you'd like to use the cooking liquid as a sauce, strain out any solids and skim off the fat. Simmer what's left in a saucepan for a few minutes, until it's thick enough to coat the back of a spoon. Serve the resulting sauce alongside the ribs. Short ribs are commonly sold as meaty individual ribs or broad strips, 2 to 3 inches high and sometimes several bones wide. Sometimes you'll also see "flanken cut" short ribs -- thin strips of meat and bone approximately 3/4 inch to 1 inch in thickness. These can be cooked the same way, though they'll only require half to two-thirds of the cooking time. Rub the cut ribs with your favorite spice rub, if you wish, to add extra flavor. Cover the ribs and refrigerate them overnight or for at least a few hours, so the spices adhere and their flavors infuse the surface of the beef. You can also marinate short ribs for a few hours, or overnight, as a way to add flavor. Western-style marinades usually combine wine or wine vinegar with oil, spices, herbs and aromatic vegetables such as onions and garlic. Asian-style marinades are usually based on soy sauce, with rice vinegar, ginger, garlic, and often spices such as star anise or Chinese five-spice powder. You can then use the marinade as your cooking liquid, if you wish, to intensify the flavor. For the ultimate in make-ahead convenience, prepare the ribs at least a day before you plan to eat them. Let them cool in their braising liquid overnight in your refrigerator, which gives the ribs' flavor time to deepen and mellow. This also makes it easier to remove any fat from the cooking liquid, because it will rise to the surface and harden. You can either package the ribs into meal-sized portions for later consumption, or strain and thicken the sauce, and then put the ribs back and gently reheat them. 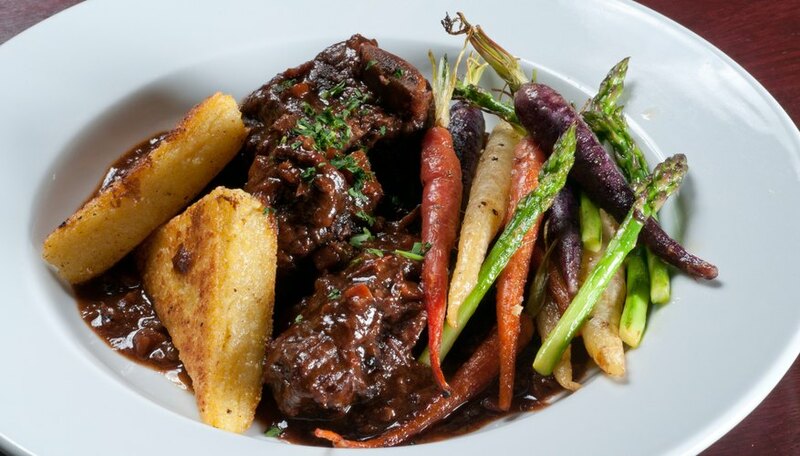 Braised short ribs make a rich, flavorful complement for most sturdy starches, such as polenta, risotto, mashed potatoes, grits, noodles or steamed rice.